A loop at the end of 8 Marta Street was opened for regular services on 3 October 1960. This loop became a new terminus for an extended line which previously had ended at a crossing of Verkhnyaya Maslovka with Staryy Petrovsko-Razumovskiy Proyezd. 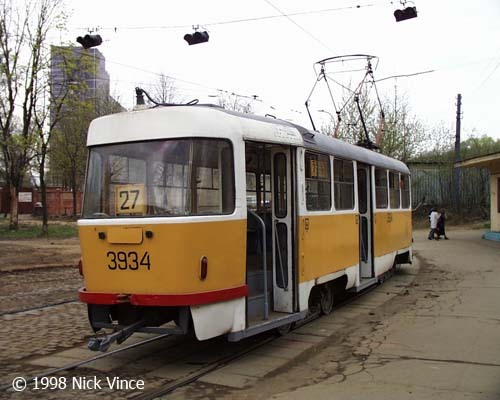 Initially the loop was used by tram routes 18 and 50 but they did not have occasion to use it long enough. In 1965 the line which was crossing Savyolovskiy overpass was 'provisionally' closed (as soon would became clear, for good). Route 18 fell into oblivion, route 50 received the Dvintsev loop as its new terminus, and the line in 8 Marta Street became operated by route 27. For more than three decades route 27 was operating in Maslovka and 8 Marta St. without any essential changes. Unfortunately, in 1999 a short stretch of line in Nizhnyaya Maslovka Street got involved in construction zone of a new motorway. The planners had decided simply to lift the tracks instead of relocating them into a parallel boulevard pretending that trees are more valuable than a tram line, but a few month later all those trees were silently cut down during the construction, leaving the place without both boulevard and tracks. To say the truth, the boulevard was later a bit restored with new trees planted, but it is now unusable due to high noise and pollution as the narrow green stripe became trapped between endless car lanes. As a result of this closure, route 27 had to be shortened to Dmitrovskaya metro and railway stations where a new terminus was built. Almost no traces of the lifted section can be found today. The loop with three side tracks was located between a railway and 8 Marta Street. 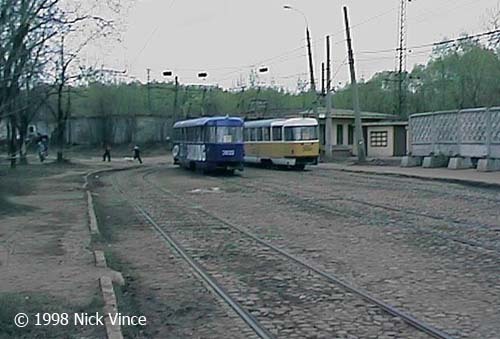 An ancient cobblestoned pavement lasted until the very end of tramway service. When buses had taken over from trams, the pavement was paved with asphalt. The control building which dates back to 1960 does not resemble richly decorated buildings of 1940s, yet it still featured furnace heating, although I do not know whether it has been in use lately. 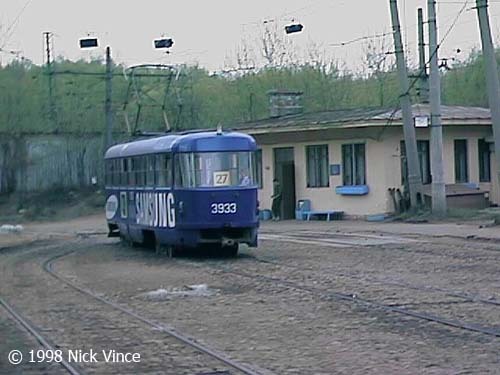 Tatra T3 #3934 is ready for a long trip on route 27 to Voikovskaya. All traces of tracks were gone by 2001. 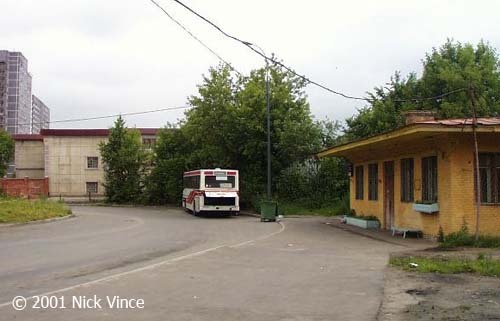 The old control building still functions, serving busses instead of trams. The road had been widened because busses cannot sneak through such narrow spaces as tram did.